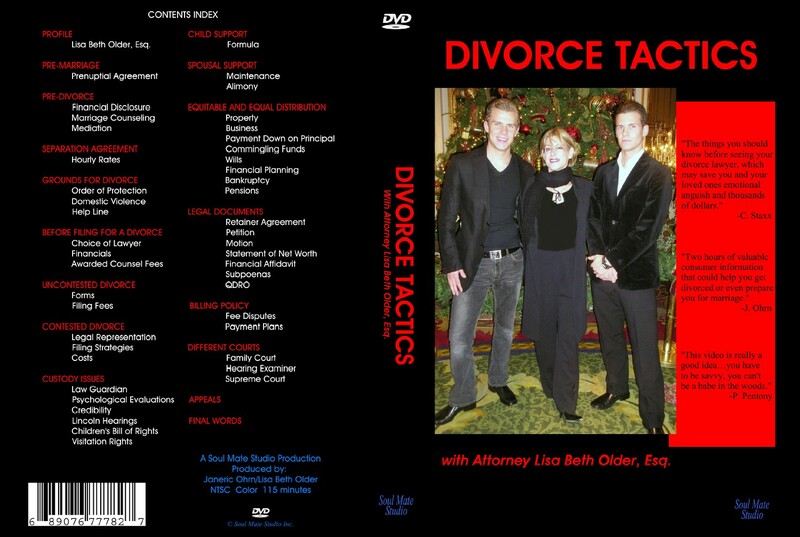 New Release: DVD/VHS "Divorce Tactics with Attorney Lisa Beth Older, Esq." This DVD/VHS "Divorce Tactics with Attorney Lisa Beth older, Esq." distributed by: http://www.amazon.com, http://www.lawofficesoflisabetholder.com, contains the things you should know about before seeing your divorce lawyer, which may save you and your loved ones emotional anguish and thousands of dollars. Two hours of valuable consumer information that could help you through the divorce process or even prepare you for marriage. Attorney Lisa Beth Older, Esq. was a product herself of multiple divorces and a "runaway from home" kid whom, after a few side gigs at the Comedy Store as a Stand Up Comic and wrestling Andy Kaufman, managed on her own to push herself through Law School, and graduated as a Juris Doctor from UCLA. Lisa Beth Older, Esq. is divorced once and married twice with both a personal and professional understanding of the heartache and the emotional as well as financial strain a divorce causes the parties involved. Lisa Beth Older, Esq. is considered one of the Top Lawyers in the field of Matrimonial Law, and in this NEW RELEASE: DVD/VHS "Divorce Tactics with Attorney Lisa Beth Older, Esq. ", distributed through http://www.amazon.com, http://www.lawofficesoflisabetholder.com, she shares her experience from having practiced Matrimonial Law for almost twenty years, and guides you through the various elements involved in a divorce to help you avoid making irreperable mistakes. Attorney Lisa Beth Older, Esq., is a Success Story. An experienced Trial Lawyer who has handled several Murder Trials and Thousands of Criminal, Family and Matrimonial Law related cases. She has made Case Law, and is also an Appellate Lawyer with many wins. She's an active Committee Member of the Democratic Party and has been nominated to run for Town Judge. She's a General Counsel for a Chet-5 Broadcasting Company and past Executive Director of Santa Monica Girls Club for 3 years. She appeared as a Television Commentator and guest on the Montel Williams Show. Lisa Beth Older, Esq. is a highly respected and outstanding member of the Legal Community. Divorce Tactics with Attorney Lisa Beth Older, Esq.The things you should know before seeing your divorce lawyer, which may save you and your loved ones emotional anguish and thousands of dollars. Two hours of valuable consumer information that could help you through the divorce process or even prepare you for marriage.